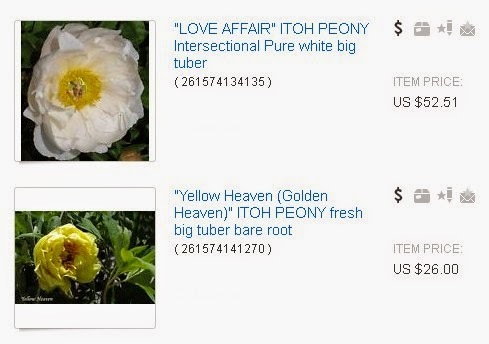 I did order a few Itoh peonies from Ebay this year. They arrived this past week, and I must say they were mostly decent size roots. 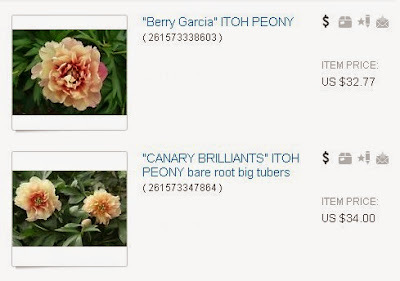 Three out of four of the roots I received were fairly large divisions, unlike some divisions I received from Ebay a couple years ago, in my 2012 Ebay Peony Order - American Greenhouses. However these were from a different vendor, which can make all the difference. Also I ordered these peonies in the fall, and the previous ones I ordered were purchased in the summer and were already sprouting. This was probably because these roots had been dug the previous fall and had been sitting around for almost a year. Unfortunately two out of four of the roots from that 2012 order died, and the other two that did live, suffered and are still small. Fall is definitely a much better time to order and plant peonies. 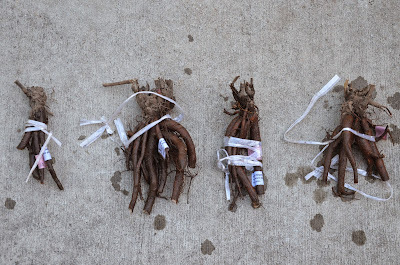 Since peony roots are typically dug in the fall, this is when you'll get the freshest roots that can be planted quickly, to give the plant the most time to settle in (and hopefully sprout more roots) before spring. The roots I got this time are Peony 'Berry Garcia', Peony 'Canary Brilliants', Peony 'Love Affair', and Peony 'Yellow Heaven'. I can't wait to see how they do in the spring! Sure. I will post an update in the spring if any of them happen to bloom next year. However these may take some time to settle in. We'll see!